Scotch Whisky Experience in Edinburgh was looking for something truly magical to tell the story of transforming malt and grain whiskies into smooth blended Scotch as part of their visitor experience. The solution was to design three-dimensional holographic content showing how various regional malts and grains come together in harmony to create the many iconic blended Scotch whiskies available today. Neither a distillery, nor a museum – the Scotch Whisky Experience delivers the audience into the world of whisky through various media. You can have a dram of Scotch and taste the richness and every nuance of flavour for yourself, but to convey the intricate craft of blending in a short period of time is not a simple task. The explanation of this art can become quite complex and bemusing. tour guides delivering a monologue on which regional types of Scotch have which characteristics. As the experience already includes a virtual distillery tour in a whisky barrel illustrating the malt whisky production process, the idea of embracing mixed reality was not too far fetched. There has always been a bit of magic and mystique to producing Scotch, and as mixed reality is a technology exuding quite a bit of magic – it was perfect for the Scotch Whisky Experience. Realfiction partner Animmersion helped guided and inform which type of displays would be best and most impressive to play the holographic content around an actual bottle. The idea of using the holographic displays was to be able to tell the story to anyone in any audience; to be as accessible as possible to all. At the same time, the Experience wanted to surprise and delight visitors and convey the magic of the whisky production process. During the creative process, Freakworks, the appointed film company, showed a video of a three-dimensional Champagne bottle, and that immediately sparked lots of suggestion. Blended whisky is a complex and skilled art and getting it right is difficult but going into too much detail on the Scotch Whisky Experience’s standard tour would have bored visitors, so a more exciting way of telling this story was required. Regional single malts have their own trademark house flavours, and in the holographic content this is illustrated using different colours. The bottle fills with differing colours indicating the different flavours creating the blend. Musical chords are also linked to the colours to create a fully immersive audio visual experience. 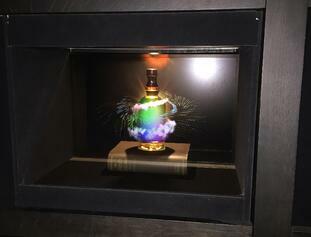 Using the holographic display and content has been a great success, and the Scotch Whisky Experience is delighted with the audience’s reaction to the bottles. Gillian Beaton, Business Development Marketing Manager of Scotch Whisky Experience. 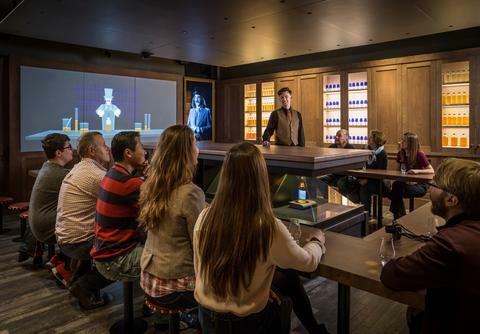 The Scotch Whisky Experience is very pleased with the results of their holographic displays which allow them to tell a story of liquid alchemy and to convey the facts as well as keeping some of the mystique that surrounds this golden spirit. They have even foregone the standard technical language and quite simply call their displays the ‘holodrams’ – tipping their hat to the magic that is Scotch whisky.